Luxury Self Catering Accommodation. With a spectacular waterfront location overlooking the Atlantic Ocean & Ballinskelligs Bay, Fuchsia Lodge is a luxury purpose built holiday home ideally situated on the Ring of Kerry. Surrounded by a half acre of private garden with stunning views of the Atlantic – the lodge makes an idyllic retreat for anyone that wishes to explore and enjoy the Southwest of Ireland. Everything about Fuchsia Lodge is designed with the guests ultimate comfort in mind. It is tasteful in its décor, stylish in its choice of furnishings and fabrics and creative in its use of light. Fuchsia Lodge is located on the Wild Atlantic Way and is in the center of the International Dark Sky Reserve. The night sky around the lodge is one of the most amazing views you will enjoy, including the milky way on clear nights. The village of Waterville is famous throughout the world for its championship links golf course & superb sea trout and salmon angling. The area is blessed with some of the most spectacular scenery in Ireland & offers walkers and cyclists endless possibilities for sightseeing & touring. The area boasts an abundance of ancient historical sites, among these are the 6th century Skelligs UNESCO World Heritage Site, the Stone Fort at Loher and 6th century ruins on Church Island. The area is particularly popular with artists & nature lovers. There are endless possibilities to experience the indigenous flora & fauna first hand. The village has attracted numerous celebrities over the years, from Charlie Chaplin to world famous golfers, such as Tiger Woods and Mark O'Meara. Fuchsia Lodge has four bedrooms, all en-suite & elegantly furnished. Slightly different in size & shape, they all share a common point in decoration & simple sophistication. All lavishly furnished with rich textiles, dark stained furniture & Egyptian cotton bed linens. There are three king-sized bedrooms & a spacious double bedroom. One of the king-size rooms can be made up as a twin room, if preferred. The open-plan kitchen, dining room & living room is the focal point of the home. The feature dormer window offers breathtaking views directly on to the bay & the majestic mountains, which tower high above the water. The fully fitted kitchen includes a microwave, dishwasher, oven and hob. Additional facilities include a sauna, a fully equipped utility room and wet room and a mezzanine relaxation area with a library, flat screen TV, Satellite, DVD & video player. Under floor heating and high performance double-glazed windows ensure a cosy, comfy living environment no matter what the weather is doing outside. Open Plan Living Room & Dining Room. Seating area to accommodate 8-10 people. Flat screen TV. Optiflame Fire. Mezzanine. Seating area. DVD / Video Player. Library. Power Showers in each bathroom. Shaver sockets. Quality towels supplied. Geothermal underfloor heating with individual thermostats in each bedroom. Continuous hot water 24 hrs. Egyptian cotton linen. Extra pillows supplied. Bath, hand and face towels supplied. Beach towels supplied. 3 separate lounge areas. Large open plan living area with seating downstairs and tv area. Well equipped kitchen. High quality fixtures and fittings throughout property. We loved this house and its location. The view of the ocean was incredible to wake up to daily. Also loved the countryside and the small town of Waterville! This was our second trip to Fuchsia Lodge. The house is wonderful with every facility and amenity. We particularly enjoyed the expansive living/family space and loved the welcome treats and goodies. Thank you Caragh & team. We're already planning our trip for next year. Wir verbrachten zum vierten Mal unsere Ferien in diesem traumhaften Haus. Die Innenausstattung und der Komfort lassen keine Wünsche offen. Die Betreuung und Hilfsbereitschaft von Mary, der Seele des Hauses ,sind einfach nur grossartig. Wir freuen uns auf ein Wiedersehen. A great property with a beautiful view. The home was very clean and updated. It was spacious and everything worked well. The floor plan was great and included everything you would need. The grounds were terrific and we were able to take long walks. It was our second holiday in Fuchsia Lodge and won't the last. The house and the landscape are amazing. This time we spent 2 weeks in the end of winter and it was very stormy and rainy. But the house was pretty warm and you can end up the day in the sauna after some long walks. Everything in the house is well maintained and clean. If you need help or any information you can always ask Mary or Caragh. We will come back. 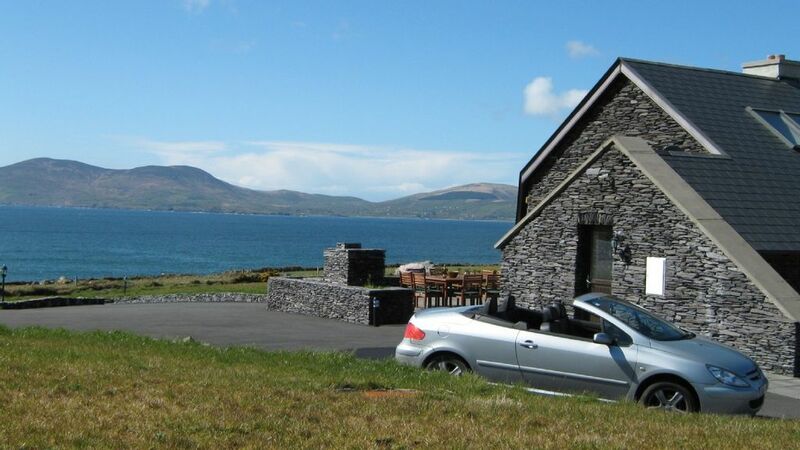 Fuchsia Lodge is situated on the edge of the Atlantic Ocean, overlooking Ballinskelligs Bay and surrounded by the McGillicuddy Reeks –Ireland’s highest mountain range. It is the ideal location to explore a wide and varied range of outdoor activities, including walking, surfing, golfing and angling. The southwest of Ireland is home to some of the world's most renowned and prestigious golf courses - names like Waterville, Hogs Head, Ballybunion, Tralee and Killarney are all ranked in the top courses in the world and are all within easy reach of Fuchsia Lodge. The area is also renowned for its diverse range of water-based activities - enjoy a day kayaking with the chance to see dolphins or seals or explore underwater, which offers some of the best and most renowned diving sites in Europe. The area is also home to a large number of Blue Flag Beaches, such as Derrynane, Ballinskelligs, the White Strand and Kells Beach. Golf: There are a large number of championship golf courses in the area. In Waterville, you have the world famous Waterville Links and the new highly acclaimed Hogs Head Golf Course. Dooks, Ballybunion, Tralee, Killarney and Ring of Kerry Golf Courses are all within easy access of Fuchsia Lodge. 1. Electricity and heating are included in the rental rate. 2. The rental rate includes the provision of bed linen, towels and all other household linen. Beach towels also provided. 3. On departure, the house, equipment and utensils must be left in a clean and tidy condition. A deduction of € 150 will be debited from the security deposit, if the property is not cleaned properly on departure.